I need to come clean. 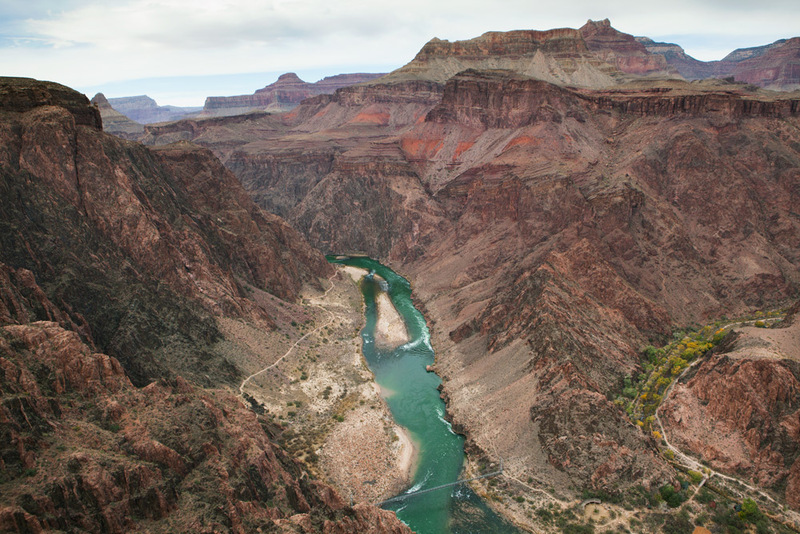 When I joined Colorado River Ecosystem v. Colorado, the first-ever federal lawsuit to seek personhood and the rights of nature for a major ecosystem, my intentions were not completely sincere. The truth is, I never thought we had a chance in hell. I saw the lawsuit as an opportunity to guide concerned people through a process that would shatter their false hopes, replace them with experiential knowledge of the vast difficulties inherent in working for change within the legal system and catalyze more effective action. The lawsuit failed, of course. The Colorado Attorney General privately threatened the attorney representing us, Jason Flores-Williams, with sanctions if he did not withdraw the case. When he refused, the Attorney General formally filed a request for sanctions with the court and a motion to dismiss in the same afternoon. Flores-Williams, afraid that he could not respond adequately to both the sanctions and the motion to dismiss, voluntarily withdrew the case. When filing a lawsuit, however, it’s best not to proclaim publicly that you expect the case to fail. Judges jealously guard their calendars from anything they perceive to be a waste of time. Corporate and government lawyers vigilantly monitor individuals involved in cases filed against them for any opportunity to argue that novel legal theories like the rights of nature are frivolous, to label them as attempts to harass corporations or government, and to demand that they be punished with sanctions. Media pundits search for audio clips and social media posts to take out of context while accusing grassroots groups of filing lawsuits as a backhanded fundraising ploy. At the same time, and in order to shatter as many hopes as possible, it was necessary to attract attention. No one likes a loser. If our supporters caught so much as a whiff of my true disbeliefs, when the case failed, they could mistake the failure as the result of the half-assed efforts of activists who weren’t truly committed, instead of the result of a legal system designed to protect exploitation of the natural world. So I suspended my disbelief and dove zealously into the work. For four months, the lawsuit was my full-time job. I sifted through case law for opinions supporting our position. I wrote a portion of the document, called the “complaint,” that signaled the official filing of the lawsuit. I wrote a series of articles describing the need for the rights of nature. I gave interviews to journalists, radio hosts and members of Comedy Central’s The Opposition production team. And I bit my tongue over and over again. In the five weeks before the case was dismissed, I put 4,000 miles on my 2004 Jeep Grand Cherokee traveling with photographer Michelle McCarron around the Colorado River Basin. After all that stress, my poor Jeep’s transmission blew up yesterday, so I have nowhere to go and nothing to do but reflect. With time so short and the need for effective action so great, I wonder if I wasted my time appealing to a legal system that exists to protect those destroying the natural world. I wonder if I betrayed the trust of the good people rooting so hard for the lawsuit to succeed. Worst of all, I wonder if I betrayed the river. I bit my tongue on the steps of the Alfred A. Arraj Federal Courthouse in Denver, for example. I stood before a crowd gathered to hear me speak about the lawsuit. We were supposed to have a hearing, but the court had postponed it at the last minute. With so many of us traveling to Denver from across the Colorado River Basin, we decided to proceed with the press conference anyway. It wasn’t the anxiety that public speaking can induce that produced the tremor in my hand, the acid in my gut and the quiver in my voice. It was a simple question, unresolved: Is it dishonest to speak of hope when you feel none? I began my speech explaining that I had arrived there after spending three weeks with the river. I recounted the violence I witnessed in La Poudre Pass, where the Grand Ditch lies in wait to steal the Colorado River’s water moments after the union of snowpack, sunshine and gravity gives her birth. I reported the energy expended in pumping the river’s water uphill from Lake Granby reservoir to Shadow Mountain reservoir and then into Grand Lake before the Alva B. Adams tunnel drags the water 13 miles across the Continental Divide and beneath Rocky Mountain National Park to meet Front Range demands. I described the view from Palisade, Colorado, where peaches are grown in the middle of the desert and crisscrossing canals, seen from the mountains, appear as vast, mechanical tattoos sewn into the flesh of the land. I paused at this point, knowing that after presenting my audience with this series of distressing images, I was supposed to leave them with a positive message. While I reflected on what I had seen and said, however, I felt the river’s truth spill over me. For weeks, I thought I had been listening to the Colorado River. But she isn’t a river anymore. Not truly. She has been so diverted and dammed, experienced so much extraction and exploitation, that the best way to describe her is not as a river, but as an industrial project, as a series of tunnels, concrete channels and canals, as another tortured corpse stretched across civilization’s rack. While this realization washed over me, I considered our lawsuit and the rights of nature. I wondered if it is possible to grant rights to a ghost. I questioned whether the Colorado River could ever recover from what’s been done to her. Grief threatened to overwhelm me, to silence me in despair. If I had been by myself, caught in the flow of these emotions in private, or if I was simply being honest, I would have fallen to the concrete and wept. I steadied myself and as the despair trickled away, rage rushed in to take its place. That rage burned with the heat of the desert sun reflected in the Colorado’s face and I knew that, ghost or not, she who haunts is not dead. But, again, I said nothing of her rage, of her attempts to knock down dams, of her furious floods. I said nothing to acknowledge her ghost. Instead, in calm, reasonably legal tones, I urged the crowd to support the rights of nature. The case is now finished. I can stop biting my tongue and spit the blood out. I can be honest. If I betrayed you, I am sorry. If I betrayed the river, I beg forgiveness. As an act of penance, I offer the stories that follow. These stories are what I really think. These stories are what I wish I said when the journalists were scribbling down my words, when I sat, live and on air, at the radio microphones, and when the cameras were recording. These stories are the truth. We listed the river as the only plaintiff, so it could be properly said that the Colorado River herself was suing the State of Colorado. Major ecosystems are not currently considered capable of bearing rights or filing their own lawsuits under American law, so I agreed, with four others, to serve as a “next friend” of the Colorado River. Similar to guardians ad litem, next friends represent the interests of those deemed legally incompetent, such as children, the mentally disabled and rivers. Simply put, next friends speak for those who can’t speak for themselves. 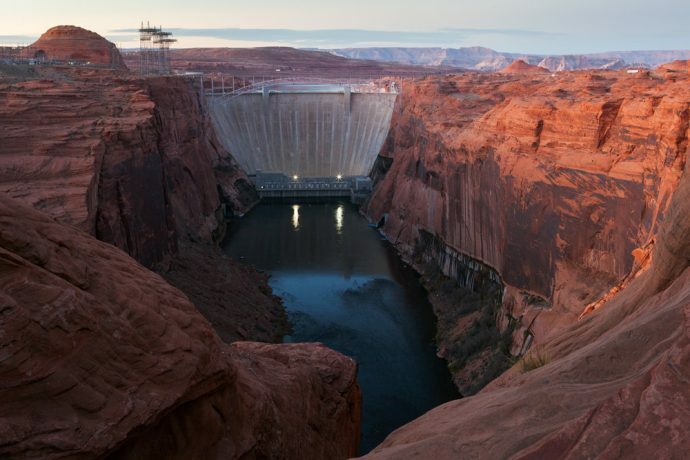 On a general level, it’s not difficult to understand the Colorado River’s interests. A simple Google search will tell you that pollution kills the river’s inhabitants, climate change threatens the snowpack that provides much of the river’s water, and dams prevent the river from flowing to the sea in the Gulf of California. But, friendship, even legal “next friendship,” entails an intimate and personal relationship. To best represent the Colorado River’s interests, to be her friend, I wanted to build this intimate, personal relationship with her. To build a relationship with someone is to speak with her, to spend time with her, to listen to her. And that’s what I did. My trip with Michelle around the Colorado River Basin was guided by two questions. Everywhere we went, I asked the Colorado River: “Who are you? And, what do you need?” I asked these questions out loud, so she could hear them. I will not apologize for talking with a river. The Colorado River speaks, but apparently not in a language many humans understand. Water is one of life’s original vernaculars, and the Colorado River speaks an ancient dialect. Snowpack murmurs in the melting sun. Rare desert rain drops off willow branches to ring across lazy pools. Streams, running over dappled stones, sing treble while distant falls take the bass. I am human, so I am an animal. Even though the colonization of generations of my ancestors, personal trauma and cultural conditioning threaten to deafen me, I am still capable, through my animal body, of hearing the languages of life. And I believe you are capable, too. If you’ll only try. Though the lawsuit failed, I made a friend. When your friend is in grave danger, you do everything in your power to protect her. If you don’t, you cannot call yourself her friend. The Colorado River is in grave danger and as her friend, I know I must do everything I can to protect her. If my animality gives me the ears to listen, friendship requires that I find the tongue to translate the languages of life. Human, animal, friend…these three existences combine and compel me to translate her voice from the languages of life into English. To truly understand someone, you must begin at her birth. So, Michelle and I spent two days looking for the Colorado River’s headwaters in the cold and snow above La Poudre Pass on the north edge of Rocky Mountain National Park. The pass was accessible by an unpaved, winding, pot-holed trek named Long Draw Road. It took us fourteen miles through pine and fir forests and past the frigid Long Draw Reservoir before ending abruptly in a flat where the red trunks and brown branches of winter willows braced themselves against the breeze. The road was covered in an inch of frosty mud that required slow speeds to avoid sliding into roadside ditches. 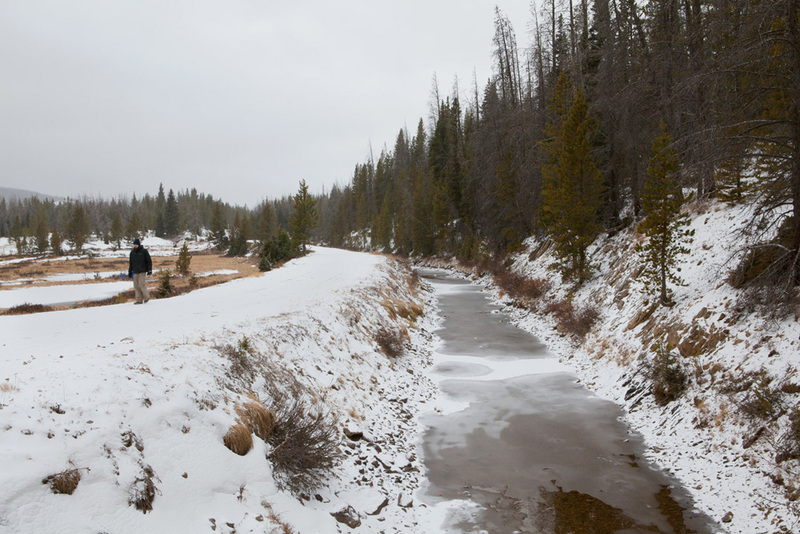 The road’s ruggedness and incessant bumps combined with sub-freezing temperatures to ask us if we were serious about seeing the river’s headwaters. I was worried that Michelle’s ’91 Toyota Previa might struggle up the pass, but the van continued to live up to the Previa model’s cult status. Long Draw Road foreshadowed the violence we would find at the river’s headwaters. Swathes of clearcut forests escorted us along the road to the pass. The Forest Service must have been too lazy to remove any single trees that fell on the road because their employees had simply chainsawed every tree within fifty yards of the road. About three miles from the road’s end, we ran into a long, low dam trapping mountain runoff into Long Draw Reservoir. We had been expecting to find wilderness in La Poudre Pass, so encountering the dam felt like running into a wall in the dark. The clearcuts, dam and reservoir were grievous wounds, but none of them were as bad as the Grand Ditch. We walked a quarter-mile from the end of Long Draw Road and found a sign marking the location of the river’s headwaters. On our way to the sign, we crossed over a 30-foot deep and 30-foot wide ditch pushing water from west to east. We were on the west side of the Continental Divide, where water naturally flows west, so we contemplated what black magic engineers had employed to achieve this feat. The ditch was as conspicuous in La Poudre Pass as a scarred-over gouge on a child’s face. The Grand Ditch was begun in the late 1880s, dug by exploited crews armed with hand tools and risky dynamite. It was built to carry water, diverted from the Colorado River’s headwaters, east to growing cities on Colorado’s Front Range. About two feet of swift water ran through the ditch. Even before melting snowpack forms the tiny mountain streams identifiable as the Colorado River’s origins, water is stolen from her. Pausing in a half-foot of powder, I wondered whether the water stored here would end up on a Fort Collins golf course or stirred by the fins of a vaquita porpoise in the Gulf of California. I asked the Colorado River for the tale of her nativity. She described her birth from a wild womb formed by the oceans, the sun’s consistency, heavy winter clouds, tall mountain peaks and snowpack. She rues that her emergence from this womb led immediately to her exploitation. And the young Colorado River hates the violence that will follow her the rest of her life. In most places, life protects the modern human’s fragile sense of self-importance by veiling the weight of time in the soft accumulation of soil, by disguising the vastness of the universe in the reassuring consistency of an undisturbed horizon and by salving existential angst with a diversity of nonhuman companions. There are places, however, where life refuses to disguise herself and human self-importance disintegrates. The red rock deserts and canyon lands of southeastern Utah, where we followed the Colorado River, are some of these places. The reality of time, frozen and piled where the land was rent into mesas and plateaus, crashes down on human consciousness where human bones shiver in the shadows and foreshadows are whispered by stones, boulders and the bones of the land. She beckoned us south through these lands. She fled through the sheer red rock walls that she sculpted as monuments to her power. She paused, at times, in warm pools, to let the colors of stone reflect from her face and to rejoice in her own beauty. To interpret her work as vanity is to misunderstand; only her creations are worthy of her celebration. The waters flowing through our bodies coursed against our skin and tugged on our veins, yearning to mingle with their kin. We ached with regret for the moment life would necessarily drag us from her banks. Mesmerized and seeking the confluence of the Green and Colorado Rivers, we got lost in Canyonlands National Park. We failed to reach the confluence, and thus failed to speak with the two rivers. At first, we were angry with ourselves. We ended up hiking close to fourteen miles in seven hours, up canyon walls abruptly rising six or seven hundred feet, through a rainstorm and across canyon floors covered in several inches of loose sand using muscles we forgot we had. We thought we had done it all for nothing. Worst of all, feeling a responsibility to tell the Colorado River’s story, we thought that we had let the river down. But the deeper I think about it, the clearer an image of the river, waving through the orange sunshine of a desert dusk, becomes. She seems to smile with the compassionate gleam of a wise elder. “You should have known,” she says. And now I do: We did not simply miss the cairns, lose the trail, and end up five miles south of the confluence and six miles from our cars after sunset. No, we lost more than the trail. We lost our self-importance. And only humility remained. Water is life. But water is also death. Water brings a pleasant taste to the parched tongue, but water also brings stinging numbness to the warm-blooded. Water taken through the esophagus brings hydration. Water taken through the lungs brings suffocation. Water may be disrespected for a time, but the longer the passage of water is hampered, the angrier water becomes. Water has a long memory and, where others forget, water carries pollutants and poisons for decades. When I think about what it would mean to fully recognize the rights of the Colorado River to exist, flourish, regenerate and naturally evolve, I know the river will demand a reckoning. I know this lyrically and I know this ecologically. Lyrically, the river is full of righteous rage. Ecologically, too many humans have come to depend on the exploitation of the river and the rest of the natural world. The balance that must be achieved will come with profound pain. Humans will die, their lifestyles will be dramatically changed and those who require the gifts of civilization will see those gifts taken. The black waters of the dammed Blue and Colorado Rivers stroked the Dillon Reservoir walls with their dark thoughts and taught me these lessons. It was several hours after sunset and well below freezing. A certain morbidity rose from the artificial lake and crystallized to hang in the air. Somewhere out of sight, but perilously near, I could feel the stirrings of anger. I sensed that the anger was slow to swell, but irresistible when fully aroused. I was mesmerized by the stars spilling over ripples and by the crescent moon’s silver threads, two nights from new, dancing across the water. In the town of Dillon below, harsh electric lights sparked and crackled with a troubled tension. The images came unbidden. The first faint crevice appeared in the earth-filled wall. Water hissed as it pushed through. Rivulets appeared as tears rolling down the dam’s face. Then, a series of sharp cracks rang out like the reports of heavy ordnance announcing the onset of battle. Earth and stone blasted away to fall into the valley. Water rushed into Dillon. Poles holding power lines snapped like toothpicks. Chunks of asphalt were ripped up. Automobiles flipped and tumbled like pebbles on a creek bed. Factory outlet stores, gas stations and multistory hotels were washed away. The white torrents that cascaded from the broken dam were flecked with joy. The waters retook the Blue River’s original path. The waters from the Colorado, knowing they would never rejoin their mother, were gladly adopted by the Blue. It was all over in a matter of minutes. This sudden demonstration of natural power passed and a quiet peace settled where Dillon once stood. The peace wasn’t without pain. Human bodies floated facedown among the wreckage. The water regretted the deaths, but knew the human bodies would be broken down and used to heal the wounds humanity had created. As the vividness of the images faded, I was left with the echo of a warning. I recalled all the dams in the Colorado River Basin, all dams everywhere, and I prayed that a peace could be made with the dammed waters of the world. I’ll never be able to drive past a dam in the Colorado River Basin and ignore the highly endangered bonytail chub who can no longer visit most of their traditional spawning beds. I’ll never be able to read the billboards praising the peaches of Palisade, Colorado, or the melons of Green River, Utah, without remembering dried up willow forests where the songs of nimble southwestern willow flycatchers have fallen silent. And whenever I close my eyes to recall the Colorado River, that blue ribbon twisting through rocky mountains and red rock canyons, I won’t be able to unsee her suffering. As I process the last four months, I’m left with Roy’s brilliant words: I am no longer innocent and it is time to be accountable. Disbeliefs may only be suspended for so long before they slither through slits in the veil separating consciousness and subconsciousness as anxieties. Anxieties, similarly, may only be silenced for so long before they push through lips and teeth as words. Disbeliefs, anxieties and words, when true, spawn in reality. The reality is that the loss of life on Earth currently outpaces our various resistance movements’ responses. Those in power enforce infinite growth on a finite planet. The planet’s life-support systems are resilient, but they can be pushed beyond their ability to recover. This means there is a deadline. While it is unclear when that deadline will pass, the deadline exists. If we do not stop the assaults on the planet’s life-support systems like the Colorado River, life on Earth may be impossible for a very long time, if not forever. We have little time to waste on ineffective tactics. In all my time spent listening, I did not hear her speak of a judge’s gavel, of evidentiary proceedings or of the State of Colorado’s motion to dismiss. She cited no precedent, no binding legal authority and no argument made by silver-tongued attorneys. She did not fear questions of jurisdiction or the threat of sanctions. No, her fears are physical and real. She fears poisonous mercury and too much selenium. She fears climate change causing less and less snow to fall and depriving her of replenishment. She fears dams. If I could start the lawsuit all over again, maybe I would refuse the interviews, refuse to write the complaint, refuse to write anything at all. Instead, I would insist that you sit on the river’s banks, listening. And if you hear the Colorado River’s rage as she slaps the face of a dam, you’ll know that court orders aren’t the only way dams fall. This article and the photos therein are the sole property of Will Falk and © Michelle McCarron and may not be reproduced or republished elsewhere without the explicit permission of the author or photographer. Special Thanks to Voices for Biodiversity where this piece first appeared. And to the Community Environmental Legal Defense Fund for facilitating our relationship with Voices for Biodiversity. Thank you Will and Michelle for sharing the story of your work and for giving voice to this wounded, but still beautiful river.